Snow news is good news! Yeah right... Mother nature can be an unforgiving @!#$%#@ when she feels like it. For all of us that complained about no white Christmas, we were soon blessed with all we could handle. My hats off to those brave fan who trudged through the aftermath to get to MSG. Matt Gilroy was given what was probably at the top of his Xmas list. A second chance to crack the lineup. Gilroy made good on his opportunities for most of the night going on to scoring 2 goals. 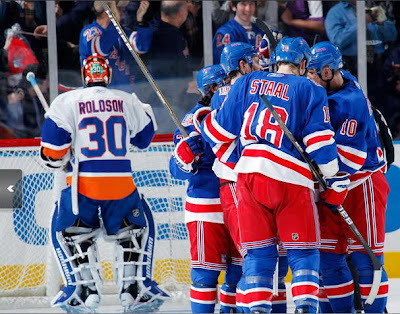 In fact it wasn't a bad night at all as many rangers would contribute to the 7-2 trampling of poor Dwayne Roloson and company. By the end, the shots were about as lopsided(52-20) as the Xmas fruitcake that gets passed around the family/office because noone wants it... and Roloson was probably wishing he was on a deserted island by the end of the last night. Can't say I blame him, he probably would have gotten better defensive coverage out of the professor,Ginger and Mary Ann than he got from his teammates. We were cautioned by the Micheletti and Gianone, that this was a different islander team than the ones we killed last time we played. Who said because they believed it, that we had to. Their scoring was the result of them rushing into our zone like they owned the place and our d-man receding too far into the zone without dishing out some punishment. Anytime a player can skate past 4 blue jerseys between the red line and the hash marks without getting hammered before taking a shot, we deserved to get scored on. These players could have easily been buried before getting to the hash marks.This may be one of the areas where we notice Cally's absence the most. 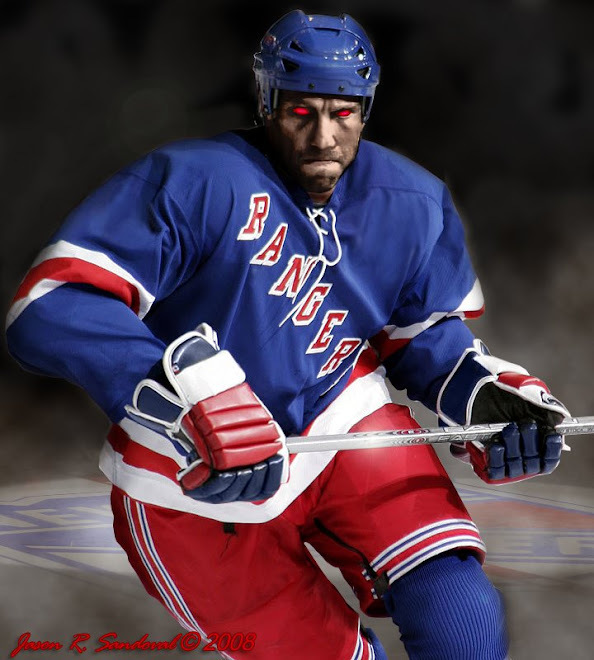 Poor or non existent second efforts by a defenseman like Girardi who figured "well once they guy has passed me, my job is done.. I tried", were much to blame for the second goal and other chances where it seemed as if we rolled out the red carpet for opposing forwards. We weren't playing mean or desperate enough for my liking. Good will towards man shouldn't count when the guy is in an opposing jersey... and we should be picking guys like Parentau out of our teeth today. They may have been riding high off a string of wins, but these were still the same guys we crushed last time around. P.S. - no matter what anyone claims, Gabby still looks to be a little stiff. I hope hes not risking injury again. And it's great to see Zooks get a longer look while Callys out.